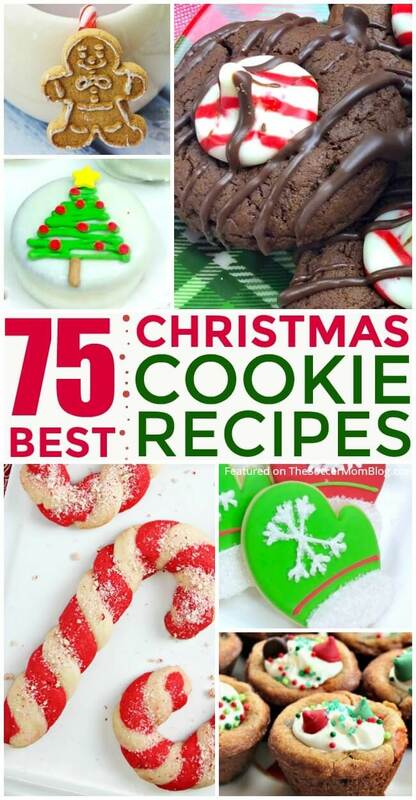 The BEST Christmas cookies recipe collection! Over 75 favorite recipes with more added regularly! Cookies and Christmas go together like, well, cookies and Christmas!! If you’re looking for something new to share at the holiday parties this year, you’ve come to the right place! I put out the call among my food blogger friends for their BEST Christmas cookies and they did not disappoint! 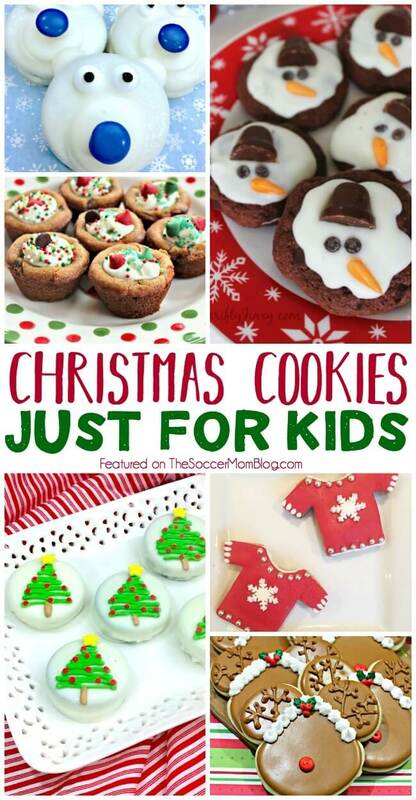 I’ve divided this best Christmas cookies collection into categories for easier navigating. Some cookies might fit in more than one category, but I kept each recipe to what I thought was the best fit to avoid confusion. PS- Be sure to bookmark this list because I’ll be adding to it as I discover new incredible recipes! Affiliate links may be included for your convenience; read our disclosure policy here. Oreo Gingerbread Truffles (recipe on The Soccer Mom Blog) — A fun no-bake recipe made with gingerbread Oreos. Standing Gingerbread Men Cookies (recipe on In The Kids Kitchen) — A definite stand-out on the holiday party table! These 3D cookies are sure to impress! 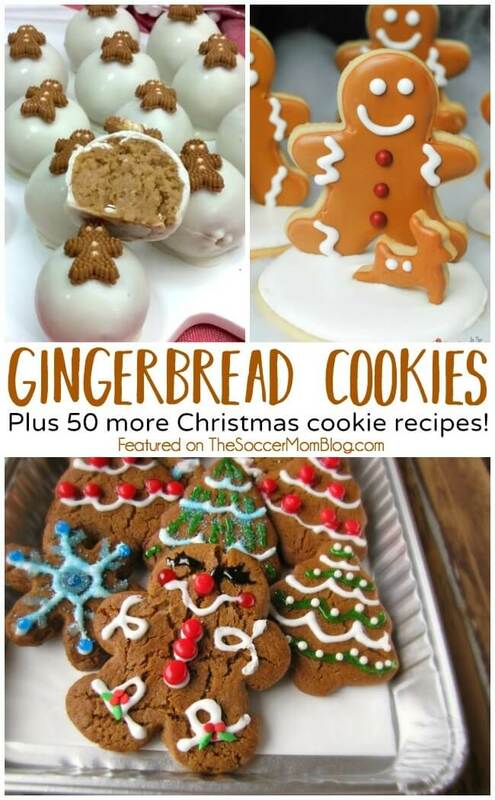 Gingerbread Man Oreos (recipe on In The Kids Kitchen) — Kids will love to make funny Gingerbread man and woman faces! Gingerbread Man Cookie Mug Tag (recipe on Extremely Good Parenting) — Keep your holiday drinks in order and enjoy a sweet treat when you’re done! Frosted Gingerbread Cookies (recipe on Simple Acres) — A go-to recipe! Old-Fashioned Williamsburg Gingerbread Cookies (recipe on The Seasoned Mom) — A time-honored recipe from the historical town of Williamsburg, VA. Gingerbread Cookie Tree Decorations (recipe on Snotty-Noses) — An edible decoration that may or may not make it to the tree! Chocolate Peppermint Thumbprint Cookies (recipe on The Soccer Mom Blog) — A festive twist on the classic Hershey Kiss cookie! Chewy Chocolate Peppermint Cookies (recipe at Beauty Through Imperfection) — Chewy and chocolatey, made with egg yolks for a richer flavor. Easy Peppermint Cookies (recipe on Natural Beach Living) — Chocolate cookies dipped in white chocolate and peppermint crumbles. Christmas Candy Cane Cookies (recipe on Home Cooking Memories) — An easy dough, twisted to look just like a candy cane! This is a gorgeous cookie! Double Chocolate Peppermint Cookies (recipe on Mama Miss) — Thick chocolate cookies stuffed with peppermint M&Ms. Red Velvet Peppermint Button Cake Cookies (recipe on The Search for Imperfection) — You’ve just got to see them! Candy Cane Hershey’s Kiss Cookies (recipe on Crayons & Cravings) — Simple and delicious! 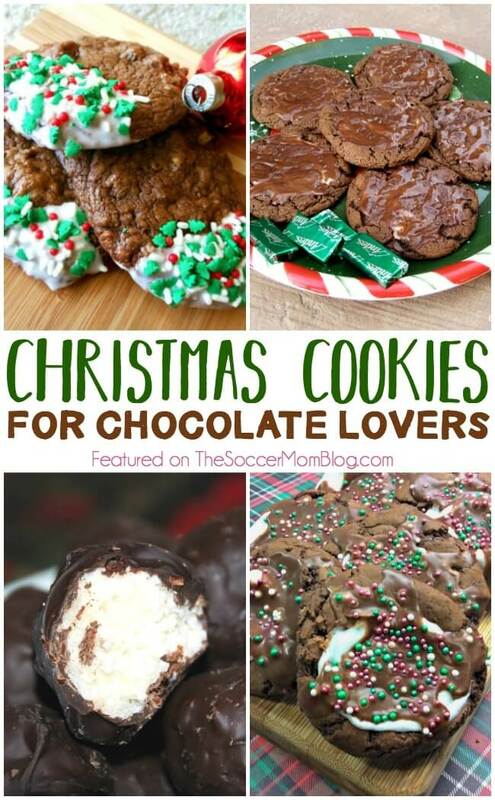 Hot Chocolate Cookies (recipe on The Soccer Mom Blog) — Just like a cup of hot cocoa…in cookie form! Nutella Blossom Cookies (recipe on Three Different Directions) — Swap Nutella for PB in classic peanut butter blossom cookies and you’ve got a crave-worthy Christmas cookie! Chocolate Walnut Brownie Cookies (recipe on Three Different Directions) — The flavors of yummy walnut brownies in a cookie, and decorated with Christmas sprinkles. Andes Mint Cookies (recipe on Artsy Fartsy Mama) — Rich chocolate cookies, smooth mint filling, and topped with more chocolate! Chocolate Coconut Truffles (recipe on Homegrown Friends) — Creamy coconut wrapped in dark chocolate. Chocolate Peanut Butter Balls (recipe on Homegrown Friends) — A to-die-for chocolate peanut butter truffle! Forgotten Cookies (recipe on Mama Miss) — A mysterious name for a cookie you really won’t forget! Low Carb Peanut Butter No Bake Cookies (recipe on Wholesome Yum) — A healthy cookie that’s easy to make too! Peanut Butter Cup Cookies (recipe on Penny Pincher Jenny) — A classic for a reason! German Chocolate Cake Cookies (recipe on The Jenny Evolution) — Tastes just like the cake…in cookie form! Twix Thumbprint Cookies (recipe on The Jenny Evolution) — Chocolate caramel goodness! Christmas Chocolate Chunk Cookies (recipe on April Go Lightly) — Thick and full of goodies! White Chocolate Snowmen Oreos (recipe on In The Kids Kitchen) — An easy chocolate dipped cookies that kids can help make. White Chocolate & Ginger Chip Cookies (recipe on Home Cooking Memories) — Smooth white chocolate with bursts of spicy ginger makes this an exciting flavor combo! White Chocolate Macadamia Nut Cookies (recipe on Creative Clever & Classy) — Sweet and crunchy, these are always a favorite! White Chocolate Christmas Tree Oreos (recipe on The Soccer Mom Blog) — Creamy dipped peppermint Oreos decorated with festive Christmas trees. Grinch Snowball Cookies (recipe on The Soccer Mom Blog) — A classic snowball cookie recipe updated in homage to the holiday movie favorite! Polar Bear Cookies (recipe on In The Kids Kitchen) — Super cute chocolate dipped Oreos that looks like cuddly bears! Christmas Mitten Sugar Cookies (recipe on The Soccer Mom Blog) — Almost too cute to eat! Brightly colored mitten cookies decorated with sparkling snowflakes. Rudolph Peanut Butter Cookies (recipe on Thrifty Jinxy) — Chewy peanut butter cookies decorated to look like everyone’s favorite reindeer. Stained Glass Cookies (recipe on Homegrown Friends) — Pretty enough to hang on a tree! Frosted Holiday Cookie Cups (recipe on Sunny Day Family) — Little bowls of chocolate chip cookie goodness, filled with fluffy frosting. Melting Snowman Cookies (recipe on Thrifty Jinxy) — Cute & chocolatey! Mickey Mouse Reindeer Cookies (recipe on Everyday Best) — Chocolate iced cookies with mouse ears make a pretty party spread! Christmas Jumper Biscuits (recipe on Here Come the Girls) — These look just like festive holiday sweaters! Olaf Cookies (recipe on For Modern Kids) — Frosted Nutter Butter cookies look just like that lovable snowman. Cornflake Wreath Treats (recipe on Wunder-Mom) — Made to look just like a holiday wreath! Reindeer Chocolate Chip Cookies (recipe on Sugar Spice and Glitter) — A classic chocolate chip cookie made to look like a reindeer. Penguin Nutter Butter Cookies (recipe on In The Kids Kitchen) — A fun cookie for holiday and winter kids parties. Chocolate Mint Penguin Stained Glass Cookies (recipe on Eats Amazing) — Cutie pie penguin cookies with a minty “glass” center. Iced Snowman Cookies (recipe on Crystal & Co.) — Cute and easy for even little hands to help with. Christmas Spritz Cookies (recipe on Mostly Homemade) — Just like Grandma used to make! Poinsettia Spritz Cookies (recipe on Arts & Crackers) — Beautiful festive flower shaped cookies. Cheesecake Spritz Cookies (recipe on Encouraging Moms at Home) — Break out the cookie press for this rich Christmas tree-shaped classic! The recipes that are passed down through generations — they’re classics for a reason! Potato Chip Chocolate Chip Cookies (recipe on The Soccer Mom Blog) — These are a new addition to our family spread, but were an immediate favorite! Bonus: they’re gluten free too! Chewy Molasses Cookies (recipe on My Mundane & Miraculous Life) — Kid approved! Eggnog Snickerdoodles (recipe on The Chaos & The Clutter) — If you love eggnog, then these are the cookies for you! The delicious smell fills the house as you bake them! Christmas Icebox Cookies (recipe on The Chaos & The Clutter) — An easy make-ahead dough recipe full of decadent candied cherries and pistachios. Red & Green Christmas Pinwheel Cookies (recipe on Growing Up Gabel) — It doesn’t get any more festive than these colorful cookies! Vanilla Kipferl (recipe on Red Ted Art) — An Austrian Christmas classic. Snowflake Butter Cookies with Jam Filling (recipe on Homegrown Friends) — Absolutely gorgeous! Shaped like a star, with a stained-glass effect. “Secret Ingredient” Shortbread Cookies (recipe on Arts & Crackers) — You’ll never guess the secret that makes these shortbread cookies so special! Maraschino Cherry Cookies (recipe on Thrifty Jinxy) — Fruity and festive! Cardamom Walnut Cookies (recipe on Home Cooking Memories) — Warm and aromatic! Cherry Delights (recipe on Sunshine Whispers) — Moist, buttery, and of course fruity! Snowballs (recipe on Sunshine Whispers) — Just about every family has their own version of this holiday classic! Italian Christmas Biscuits (recipe on Here Come the Girls) — Sweet and anise combine for a unique treat. Low Carb Cream Cheese Keto Cookies (recipe on Wholesome Yum) — A healthier version of a classic cookie. Grandmother’s Bourbon Balls (recipe on The Seasoned Mom) — Spiked with just the right amount of something to warm you up! Eggnog Gooey Butter Cookies (recipe on the Flying Couponer) — The name alone is enough to make your mouth start watering! Sneak-a-Peek Cookies with Spiced Jam (recipe on The Jenny Evolution) — A little bit sweet, a little but spicy, a whole lot of festive goodness! Want more classic Christmas cookies? Grab the NEW ebook loaded with tried and true holiday favorites! 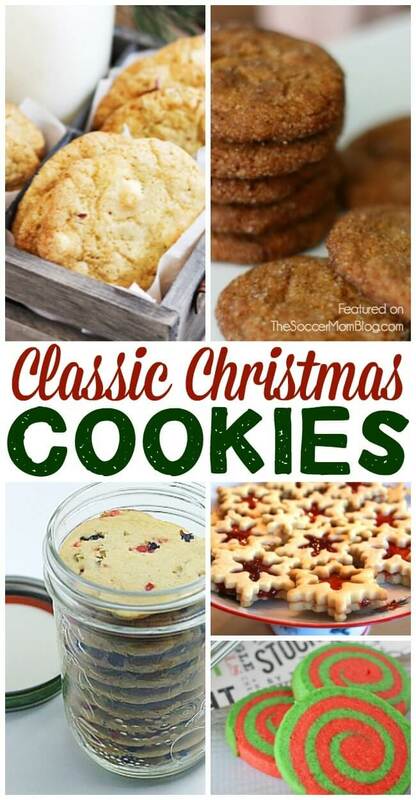 Classic Christmas Cookies by acclaimed family food blogger Jennifer Tammy features over 40 mouth-watering recipes and is a steal at only $4.99! 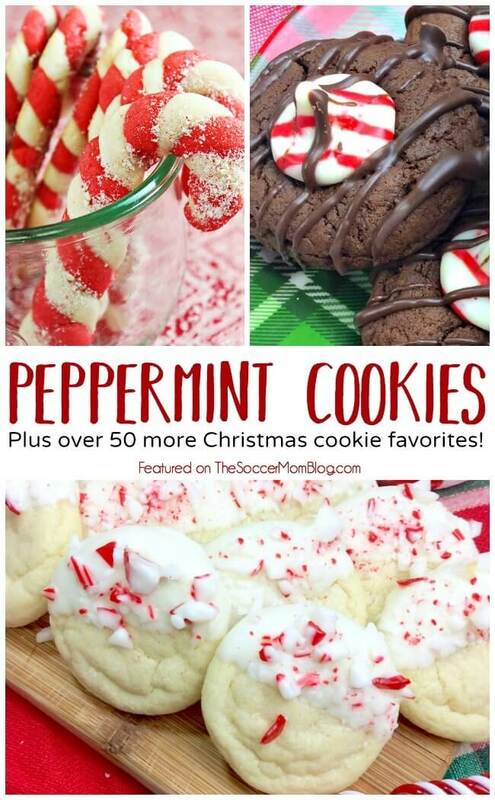 Be sure to bookmark Best Christmas Cookies Recipe Collection because I’ll be adding to it regularly! What are your family’s favorite holiday cookie recipes? Feel free to share in the comments below!